In a Nutshell: Music and marketing go hand in hand thanks to music’s proven ability to drive emotional responses and create lasting memories for consumers. Popular artists have received big paychecks for licensing major brands to use their work in commercials, but some brands don’t have it in their budget to drop six or seven figures on a commercial. 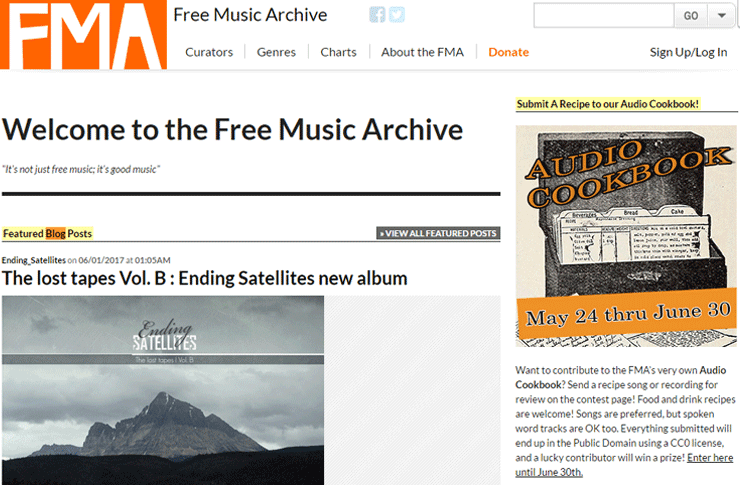 For brands that want to create a similar effect on potential customers, the Free Music Archive can be a valuable resource. About 98% of everything available on the site is either in public domain or licensed through Creative Commons with some designations for songs cleared for commercial use. FMA is helping artists get noticed while furthering an open-source approach to music distribution. Think about the last television commercial you watched. Now, think about how it would feel without background music. Even the term “background music” doesn’t do justice to how much music can influence marketing efforts. From the 1960s’ Oscar Mayer Wiener jingle to the 1980s’ California Raisins commercials to Apple’s mid-2000s iPod commercials with silhouetted people dancing, memorable music is the common thread and much of the reason people remember these iconic ads. While music certainly is an essential element in effective video advertising, it’s also not always cheap. For instance, carmaker Cadillac paid Led Zeppelin several million dollars to use its classic hit, “Rock and Roll” in 2001, which actually ended up paying off with a sales increase of 16%. 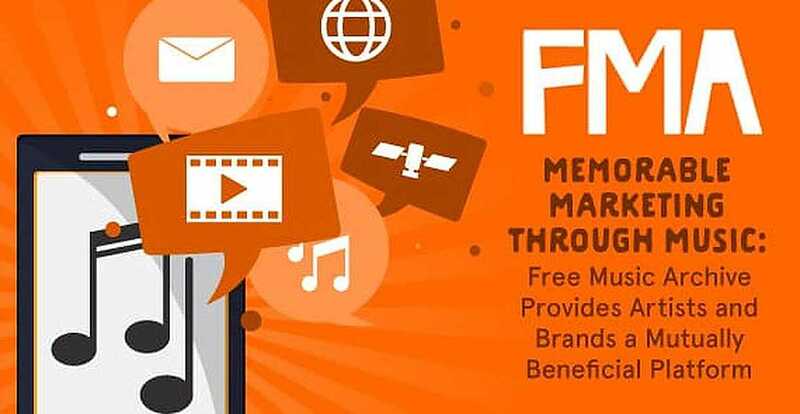 Licensing music from mainstream artists can be cost-prohibitive, but for brands on a smaller budget, the Free Music Archive (FMA) can be an invaluable resource for video and audio marketers. Launched in 2009 and directed by New Jersey-based WFMU, the nation’s longest-running free-form radio station, the Free Music Archive is an online library of curated, high-quality MP3 files that have been cleared for different uses through Creative Commons licenses. The Free Music Archive features more than 100,000 expertly curated free songs for streaming or download. Videographers and marketers can use FMA to search for songs that are free or cheap to use in commercials, which is often a win for emerging artists who benefit from the exposure that can come from having their work featured in an ad. And it’s not just TV, online, and radio commercials where music comes into play. Think about shopping in a retail store in complete silence. Music creates the type of atmosphere that keeps customers comfortable in stores and restaurants. With proper attribution, many FMA songs can be used to create a playlist that sets the ideal pace for different businesses, whether that’s playing fast-paced music to move people through faster or using a slower tempo to keep them browsing. By finding the best free music available for commercials and creating pleasurable in-store experiences, marketers can leave lasting impressions on consumers that can boost sales. From its roots in radio advertising to today’s YouTube ads, music has been used by marketers to create more compelling commercials and drive emotional responses from potential customers. A 2015 Nielsen study comparing the effects of commercials with music and those without found that those that incorporated music into marketing performed better across four metrics — empathy, creativity, emotive power, and information power. According to the study, even generic background music helped consumers recall product information. Eric Sheinkop, the co-author of a book on the subject, “Hit Brands: How Music Builds Value for the World’s Smartest Brands,” told Forbes that music in marketing has three effects for brands — identity, engagement, and currency. While we’re all probably familiar with the phrase, “all rights reserved,” when it comes to copyright law, there is another strategy for protecting the interests of creators. Known as the copyleft movement, which seeks to enhance what’s available in public domain through a “some rights reserved” approach, Creative Commons is a nonprofit that licenses the works available on the FMA site. Creative Commons (CC) licenses provide variety in terms of what an artist is allowing people to do with their work. Because the designations can be somewhat tricky, FMA includes a License Guide on its site that explains what each category means. The guide and designations make clear the conditions under which the more than 111,000 free songs on the site can be used. Brands can use the FMA search page to sort by license to find potential matches instead of going through so many songs individually. Plus, FMA has a Music for Video curator page that highlights songs that are more likely to be cleared for pairing with videos. The basis for Creative Commons licenses is CC BY, which means a title can be remixed and used commercially as long as the creator gets proper credit. A CC BY-SA (Attribution-ShareAlike) license, for instance, would likely be fine to use for marketing purposes, as long as the artist was properly credited. However, if a commercial is made with an SA license, it would have to be released under the identical license. Other CC licenses also require attribution but go on to indicate how artists allow their work to be used or if they need to be contacted about different types of use. Songs in the public domain (CC0) are free to use for any purpose, while FMA-Limited licenses mean songs are only available for listening purposes. Some music on the site is experimental in nature or field recordings and would likely not make sense for commercial usage. FMA stresses the importance of contacting artists directly for clearance if there is any question about how a song might be used, which would be especially important for any commercial use. To make this easier, FMA includes artist profile pages that provide contact information for the musicians. Artists who end up working with brands for commercially often benefit greatly. For example, Australian band Jet was unknown until Apple featured its song, “Are You Gonna Be My Girl?” in a commercial for iPods. The popularity of the ad campaign proved mutually beneficial for Apple and Jet with iPods dominating the MP3 player market and Jet’s debut album, Get Born, selling more than 3.5 million copies. Now that’s not to say that any FMA artist that allows a marketer to use one of its songs in a commercial will go platinum, but exposure is key for unknown bands. FMA’s platform is helping artists get noticed while providing marketers and videographers with an easy method of finding memorable music that drives engagement with customers. And since FMA only offers music from trusted curators, users of the site have come to expect songs that are worth their time. Other free music websites might host more songs, but FMA puts the focus on quality with every title on the site handpicked by established audiophiles. This same level of quality benefits brands and marketers looking to attach their names to artists, who just might be the next big thing.